AncientVoice is an online portal containing 23,000 plus wikified pages on Mahābhārata, Rāmāyana, Ṛgveda, Yajurveda (both Kṛṣna and Sukla recensions), Sāmaveda, Atharvaveda and Vishnu Purāna. It uses a Wikipedia style format, with millions of hyperlinks forming a network of nouns, making the cross-referencing very easy. AncientVoice is an online portal containing 23,000 plus wikified pages on Mahābhārata, Rāmāyana, Ṛgveda, Yajurveda (both Kṛṣna and Sukla recensions), Sāmaveda, Atharvaveda and Vishnu Purāna. Currently in English, but the Samskṛt version is being developed. It uses a Wikipedia style format, with millions of hyperlinks forming a network of nouns, making the cross-referencing very easy. One may start out with the noun Ayodhya in the Mahābhārata to be lead to every other references to Ayodhya in the Mahābhārata, in the 18 Parvās and 2000 plus chapters. 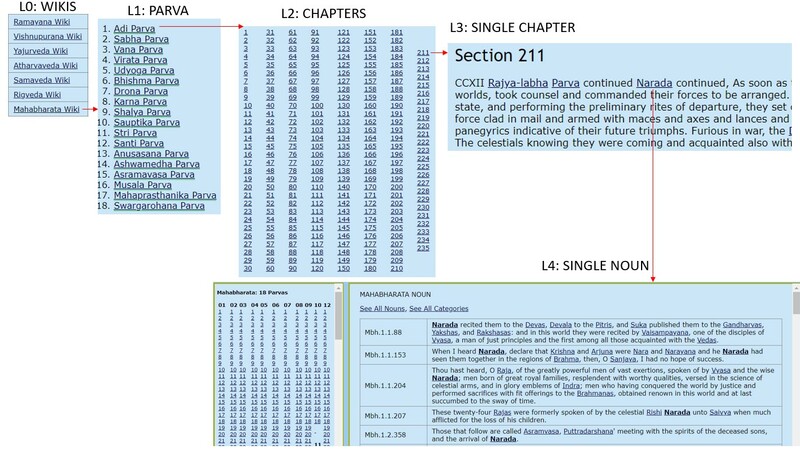 The search can be extended to Rāmāyana, to find the references of Ayodhya in each of the 7 Kāndās and 600 plus chapters or into the Vedas or Purānas, leading to comparative analysis. It also aids in studying noun to noun relationship, such as starting with noun Arjuna leading to nouns of his wives or children. 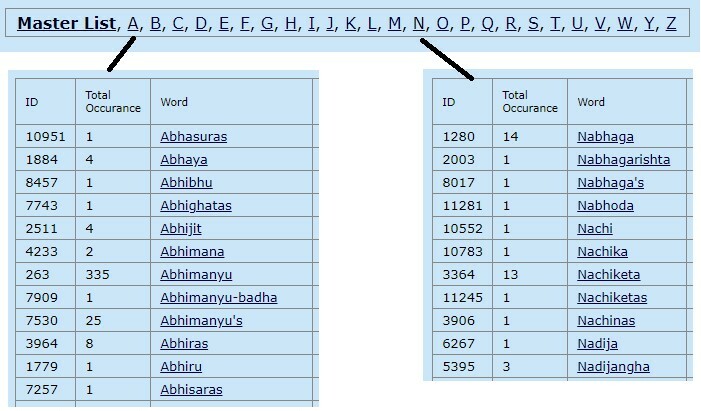 It has a database of nouns categorized into place-names (villages, cities, towns, kingdoms etc), names of kings, women, heroes, ascetics, Samskṛt non-translatables like Akṣauhini, Anīkini, Vyūha, Ṛta, Dharma, Manas, Chitta etc. The portal also hosts lineage trees of dynasties, analysis of the Yuga system, Kālachakra. It contains many art works and illustrations depicting heroes and heroines of Mahābhārata. I started reading the Indian epics from the age of ten. The Mahābhārata series of the Amar-Chitra Katha 1 books and the Mahābhārata of Krishna Dwaipāyana Vyāsa, in Samskṛt translated to Malayālam by Dr PS Nair were my first books. 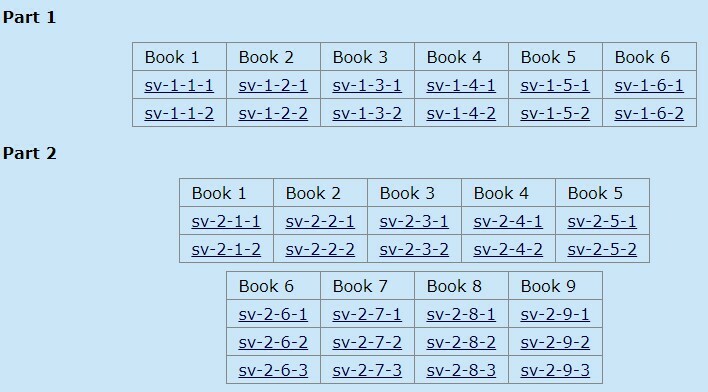 This became a craze and I continued analyzing these books. I created maps of Bhāratavarsha by locating the kingdoms and cities mentioned in the Mahābhārata on A4 paper sheets. I painted the scenes from the Mahābhārata using water color and oil paints. All this was done during 1987 to 1995 period when I was 10 to 18 years of age. My approach to reading the narratives in Veda, Itihāsa, Purānās is that mythology is nothing but a transformation of history. Absolute events transform into history after a few decades and history transforms into mythology after a few centuries. It is always possible to extract history from mythology and absolute events from history, but with a predictable loss of information. The Greek mythographer Euhemerus of the 4th century BCE of Macedonia held a similar view that many mythological tales can be attributed to historical persons and events, the accounts of which then get altered and exaggerated over time. My view on Mahābhārata and Rāmāyana is that they are the substitutes of history of the period they describe. Just like a candle-light is better than total darkness, these Itihāsās serve to tell us something about those periods. In the absence of a proper history to describing these periods, Mahābhārata and Rāmāyana serve as something close to it. They are closer to historical documents than to mythological or imaginative works. It is very inappropriate to dismiss them as mere imaginations or as fables and legends or even as mythology. Careful readers can easily separate, fact and fiction from the narrations in the Mahābhārata and Rāmāyana. Mahābhārata contains more factual narratives than the Rāmāyana where as the Purānas contain much more poetic exaggerations and embellishments than those are found in the Mahābhārata or in the Rāmāyana. Mahābhārata narrates a very realistic and factual political conflict in the Kuru royal dynasty between its Kaurava and Pāndava factions. This narrative is highly detailed so that it cannot be dismissed as a fictional narrative. No poet will labor to imagine up and render such huge amount of details at minute level such as the names of the obscure towns, villages, kingdoms and minor leaders of war. The main war-narrative is also huge and extensive like the eighteen-day war Kaurava-Pāndava war at Kurukshetra is described in five out of its eighteen volumes or Parvās (viz. Bhīṣma, Drona, Karna, Śalya and Sauptika Parvās) running into more than twenty-three thousand verses, which again make it impossible to dismiss it as a mythological narrative or a poetic imagination. Rāmāyana too has huge and extensive war-narrative of the war between Rāma and Rāvana, running into more than four thousand verses confined to one out of its 7 volumes or Kāndās viz. 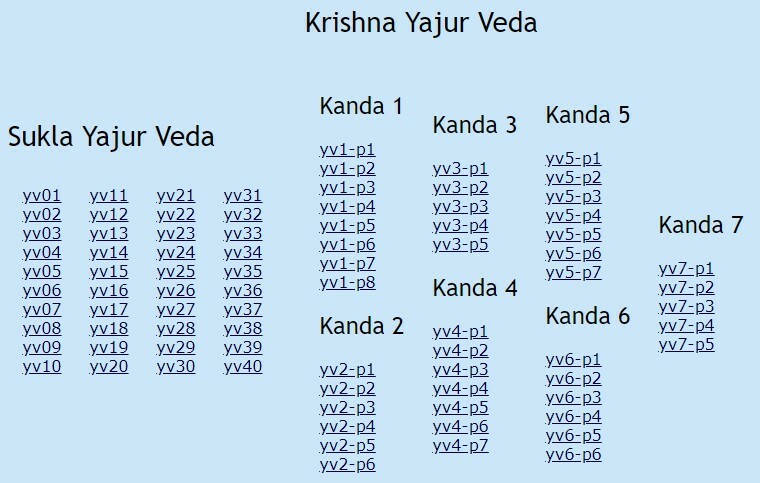 the Yuddha Kānda. Though this war-narrative is thus smaller than that of Mahābhārata, it is huge enough so that it is difficult to dismiss it as a fictional poetic imagination or a mythological narrative. However, the poet of Rāmāyana viz. Vālmīki, unlike Vyāsa, the poet of Mahābhārata, chose to render many of the war heroes as apes, bears and birds. This increases the mythology quotient of Rāmāyana in comparison with the Mahābhārata. The important point to note here is that, once we cross this outer layer of poetic imagination, the war-narrative in itself is factual and highly detailed. Compared to the two Itihāsās, viz. Mahābhārata and Rāmāyana, the Purānās contain much more poetic embellishment and imaginative narratives even though it is replete with factual data which is attested in historical records, such as the reign of the Nanda dynasty and Mourya dynasty in Magadha. 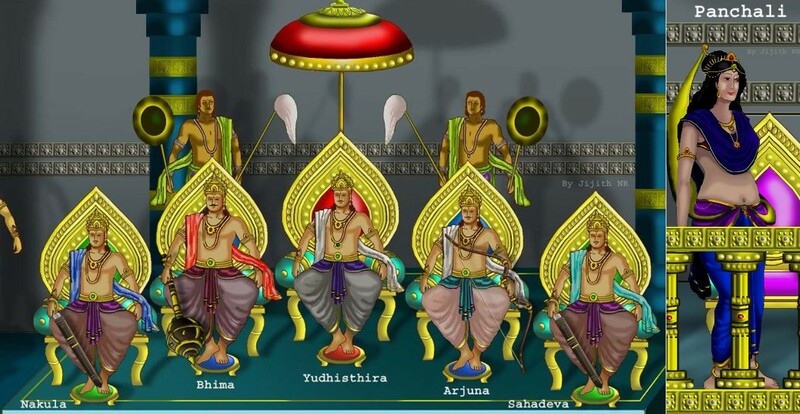 Such references in the Puranās lead to the conclusion that a large portion of their content was authored during or after the reign of these historical dynasties. Mahābhārata is the mystery of the Veda, and other subjects have been explained by me; the various rituals of the Upanishads with the Angas; the compilation of the Purānas and history formed by me and named after the three divisions of time, past, present, and future; the determination of the nature of decay, fear, disease, existence, and non-existence, a description of creeds and of the various modes of life; rule for the four castes, and the import of all the Purānas; an account of asceticism and of the duties of a religious student; the dimensions of the sun and moon, the planets, constellations, and stars, together with the duration of the four ages; the Rik, Sama and Yajur Vedas; also the Adhyatma; the sciences called Nyaya, Orthoephy and Treatment of diseases; charity and Pasupatadharma; birth celestial and human, for particular purposes; also a description of places of pilgrimage and other holy places of rivers, mountains, forests, the ocean, of heavenly cities and the kalpas; the art of war; the different kinds of nations and languages: the nature of the manners of the people; and the all-pervading spirit;—all these have been represented (in this work). The highest concentration of geographic information in Mahābhārata is found at the start of Bhiṣma Parva (Mahābhārata: Book 6 chapters 6 to 12), where he mentions more than 10000 geographic entities like rivers, lakes, place-names and names of kingdoms, regions, and sub-continents. Bhiṣma parva can be considered as the starting point of the core of Mahābhārata, authored by Vyāsa known as Jaya. The rest of the epic that precedes Bhiṣma Parva (book 6) and that succeed Sauptika Parva (book 10) is believed to be accumulated over this core called Jaya which grew to the work called Bhārata and later to Mahābhārata. Thus, true to what Vyāsa says, his work Jaya starts with astronomy (contemporary to that period) and geography. In subsequent chapters he explains the major philosophies of the age, in the form of Bhagavat Gita. Some say Bhagavat Gita is a later addition, though Vyāsa seems to know much of this philosophy himself, since one of his major activity was to analyze Vedic knowledge and classify the Vedas. The Original Vyāsa along with his race of many other Vyāsas, probably spanning many generations engaged in this activity for centuries. The surname Vyas or Byas is still popular. Since Vyāsa divided or classified the Vedas he is known as Veda-Vyāsa (one who divided or classified the Vedas). The rest of Jaya is the Kurukshetra War narrative, where he describes the art of war, its strategies and finally its ill effects. The Sabha Parva (Book 2), Chapter 14 contains passages that show glimpses of a political scenario, resulted due to the rising power of Magadha against the established Kuru rulers and how this threat is subdued by the combined policy of the Kurus (represented by the Pāndavās) and Yādavās (represented by Krishna). In a later period, we see that the Magadhās re-emerged as the major political power overshadowing the Kurus. This phase is part of the well-established recorded history. Mahābhārata also gives a glimpse of other cultures like the Nāga. 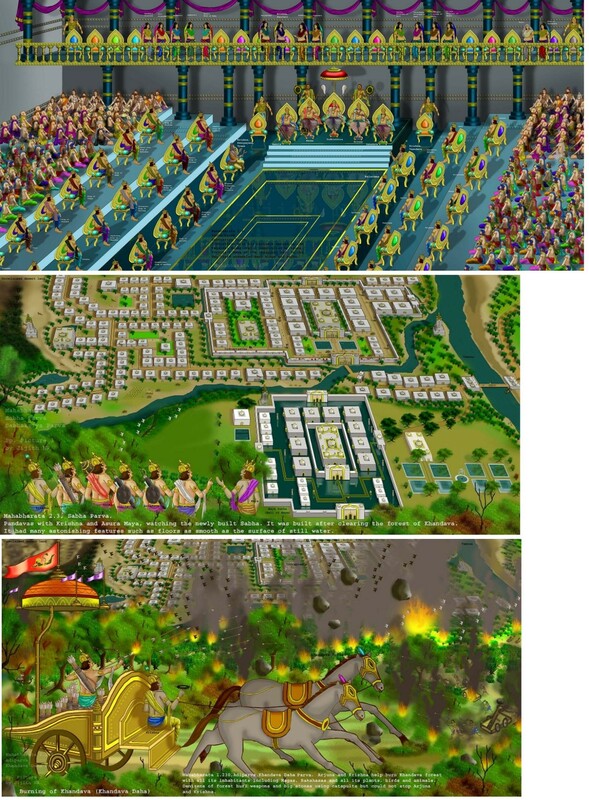 Most of the Kuru-Pancāla cities had an older name showing there Nāga origin, such as Hastinapura of the Kurus, which was formerly known as Nāga-pura. Here Nāga is taken as a synonym of Hasti viz. elephant. Yet it is interesting how the word Nāga came to mean both snake and elephant. The Maya Sabha of Indraprastha, the Pāndava city, was built by clearing an earlier settlement of Nāgas at Khandava-prastha. The northern Pancāla city Ahichatra is named after name after Ahi (Nāga). It is tempting here to suggest a Kuru invasion into pre-existing Nāga territories. But many ancestors of the Kurus were Nāgās. We have the ancestral king Nahuṣa described as a Nāga. Pāndava Bhīmā’s maternal ancestor was a Nāga. Thus, in close analysis, the Kurus and Nāgās turns out to be sharing kinships. Rāmāyana, as the name indicates is a narrative of travels (ayana) of Rāma, and thus is related to geography. At least, Vālmiki when he named the epic as ‘Rāmāyana’, which directly translates to the travels of Rāma, had this thought in his mind, and developed his epic to describe the extensive travels made by Rāma from Ayodhya to Lanka. As Vaiṣnava Bhakti traditions spread, Rāma was counted as an Avatāra of Viṣnu. This transformation is in agreement with the Dhārmic Vedāntic thought which states that divinity is inherent in every human and in every creature. It is up to any individual to express this divinity. Thus, the traditional Vaiṣnava view of seeing Rāma as a god, a divine being or an Avatāra of Viṣnu, is actually not in conflict with the view of Rāma as a human hero. The true meaning of Avatāra is descendance, viz. the descend of higher consciousness into lower realms of consciousness, which can occur in the mind of any human being. Rāma can thus be seen as a human hero who, through the inner strength of his character brought forth the descend of the higher consciousness or Avatāra within himself, enabling him to be counted as an Avatāra of Viṣnu. Hence the later generations revered him as a god. Same is the case of Krishna, as revealed by Mahābhārata. Hence, both the views about Rāma and Krishna, viz. the view that they are human heroes of extraordinary capabilities, versus, the view that they were divine beings, gods or Avatāras – both can coexist without any mutual conflict. There is no conflict between the devotees who worship Rāma and Krishna as gods and the historians who analyze the life of Rāma or Krishna, based on the information available in our Itihāsās. The devotees (Bhaktās) and the traditionalists should accommodate the study of historicity of Rāma and Krishna and the projects of dating Rāma and Krishna in a linear historical time-line. 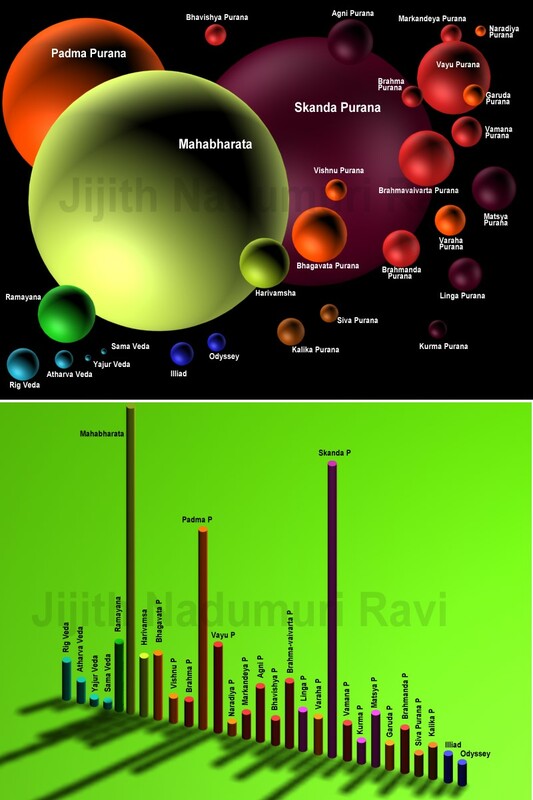 This involves the historical analysis of the Rāmāyana and Mahābhārata, focusing on the dating of events mentioned in them, including the birth and death of Rāma and Krishna, using the data present in the narrative, which primarily contains the mention of the position of the planets, sun, moon, comets and stars in the sky. For this, the analysts and researchers use disciplines like archeoastronomy, archaeology, hydrology, climatology, bathymetry and so on. Conversely, these analysts and researchers should be mindful of the sentiments of the traditionalists and the devotees. Mutual harmony between a researcher and a devotee is reinforced if both are able to subscribe to the higher philosophy of Vedanta which urges them to go beyond the imagery of Rāma or Krishna to attain the ultimate divinity, which is within one’s own self. There is many similarities between the Aitihāsic literature and fossils. Just like fossils preserve signs of the existence of a creature that lived in the past, Aitihāsic literature preserve information about the people and their lives in the past, often distorted yet reconstruct-able. Just like fossils are deposited layer by layer, Aitihāsic literature is accumulated in layers after layers. By knowing in which fossil-layer a fossil belongs we are able to approximately know in which time the creature is fossilized. Same is more or less true with information crystallized inside layers of Aitihāsic literature. The Mahābhārata has several layers which were formed at different periods of time separated by centuries. Same is the case with the Rāmāyana, the Purānas and the Vedas. Scholars are studying these layers of crystallized information to understand the life of people belonging to the period in which the layer was formed. Every civilization had an obsession to become immortal. The Egyptians mummified the dead bodies of their kings and heroes to make them immortal. We find that even after thousands of years their bodies are preserved to today, achieving some sort of immortality. The Bhāratiyās on the other hand, created the Itihāsas, the Purānas and the Vedas. They added whatever they wanted to say into these literatures and preserved them through oral traditions, with great care, like the Egyptians preserved their mummies in the pyramids. Thus, the Indians gained immortality by constructing pyramids of literature like the Mahābhārata, the Rāmāyana, the Vedas and the Purānas. Thus, we could see in Mahābhārata, the culture, the politics, the religion and the philosophy of the ancient people of Bhārata. Another analogy that comes into mind is the nature of Aitihāsic personalities and their similarities with distant light sources as explained by astronomy. In astronomy we know that some of the distant stars that we think as single are actually binary stars, multiple stars or sometimes even a galaxy of stars. Sometimes these stars that appear as one are never related and could be located at locations separated by light-years and appear as one as they happened to be on the same line of sight from us. This is true with some of the Aitihāsic personalities like Vyāsa and Vasistha. Due to their temporal-distance in the past they seem to us, when analyzing the Aitihāsic literature, to be a single person. But close study reveals them as a generation of people. Sometimes multiple personalities that lived at different ages and different places are fused together into one personality. Deep analysis of Itihāsas reveals that at their cores are actual events that occurred in some point of time in the distant past. Later, these turned into contemporary history. But unlike in our age, this historical information was transmitted from generation to generation through oral traditions. Information theory states that loss of information is inevitable due to the principle of entropy that maintains that any ordered system (coded-information being one example of an ordered system) is bound to lose its orderliness and tend to be chaotic. Ancient people who transmitted the epic history through oral traditions invented fables to fill the gaps that formed because of the missing information which was again due to information loss owing to the transmission loss. Thus, history turned into mythology. A typical example is the lack of knowledge of actual number of people who participated in the Kurukshetra War. This was substituted by a table (a hymn) that explains the relations between various divisions of the army like Akṣauhini and Anīkini (MBH 1.2). If we follow this calculation we get an impossible figure (considering the human-population of that era) as the number of soldiers and animals who took part in the war. Some historians had used this impossibility to rule out the historicity of Kurukshetra War, dismissing it as a fable. By the same way, the lack of knowledge of exact duration of the war resulted in the myth that it took place in 18 days, making the war much more impossible to occur historically. This is the negative effect of adding fables to historical facts. Sometimes the gaps in information is not due to transmission loss. The information required in a later stage is never transmitted initially but became a necessity subsequently. An example is the lack of information about the exact origin of the Kauravās and the Pāndavas. This lead to the fable that Kauravas were all born out of a dead-fetus born by Gāndhāri, which were divided into hundred pieces by Vyāsa and that the Pāndavas were born of the five well known Devatās. The fables about the birth of Drona, Kripa, Dhristadyumna and Pāncāli are other such examples. Sometimes absent information is never substituted by any fable but are approximated by other means. Examples are the names like Pāncāli and Gāndhāri (and also Kaikeyi in Rāmāyana). The original author (Vyāsa) seems to be ignorant about their actual maiden names. 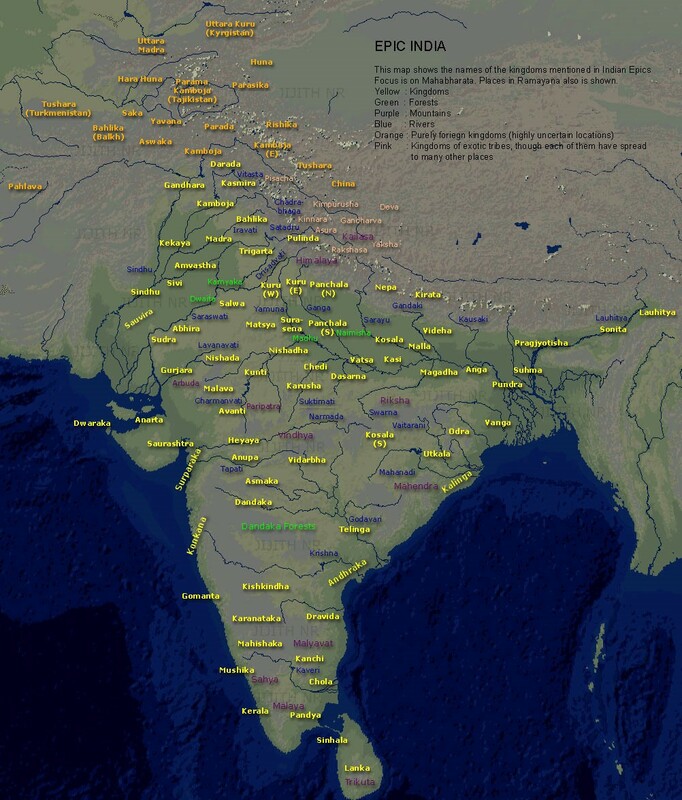 The name Panchali, Gāndhāri and Kaikeyi were derived based on their mother-land viz the Pāncāla, Gāndhāra and Kekeya Kingdoms. Another name of Pāncāli, is Draupadi, which is derived from her father Drupada, the king of Pāncāla. Yet another name of Pāncāli is Krishna, which could be the name by which she was called by her parents, but we can never be sure, since it can be a name derived from her physical appearance. She was darker in hue compared to other ladies and hence was called Krishna (the dark one). Same applies to Vasudeva Krishna and Krishna Dwaipāyana Vyāsa. The ancient sages had devised a means to minimize the transmission loss by rendering the literature as poems and hymns, coded in a metric-system (Mātra: – guru and laghu sounds) so based on their phonetics. This is much like the check-sum used to ensure the integrity of transmitted information in digital transmission. Though this helped to reduce the distortions that occurred during oral transmission of epic literature, it could not eliminate the information-loss completely. Similarly, one of the major occupation of the ancient sages and people who handled this epic literature though oral transmission was to assemble together at one place and render the whole epic committed in memory so that others can verify that they are having the same version and errors had not crept in. This tradition is still existing in India, in spite of the fact that the entire epic has already been written down and committed to text, and now into hypertext over Internet. The myth of Ganeśa writing down the Mahābhārata, as Vyāsa rendered it from his memory is a glimpse of the stage at which the orally transmitted epic is written down into text for the first time, possibly by Gana-Patis (heads of the republics) of those ages. There is a positive effect also in adding fables to historic facts. They serve to make the information more attractive and appealing which could encourage a society who were less inclined in preserving historical fact than in preserving stories that invoke a sense of wonder. The fiction part of the epic serves as an outer envelope that preserve the core historic information by continuous retelling over generations so that they reach us now (like a fruit is preserved by its outer covering, until it is ready to be consumed by its intended consumers). The ancient sages sometimes deliberately added these fables to the factual information to make the information long lived. This is a way of preserving information, which otherwise could have dissipated completely in course of a few centuries. Comparison of Illiad and Odyssey which are much less in size compared to Rāmāyana and Mahābhārata, to the extent that the later ones are considered some-how to be a retelling of the former (Homeric) works, seems to be like comparing the stars like Sirius and Betelgeuse to the Sun. Due to proximity to Earth, the Sun is the most familiar star for people of Earth. But in absolute terms Sirius and Betelgeuse are obviously much larger and majestic than the Sun. Whoever says that Mahābhārata or Rāmāyana are a retelling of Homeric works are doing this due to their greater familiarity with Homeric works and their lack of familiarity with the works of Vyāsa and Vālmīki. I was introduced to computers when I was in 9th standard in 1992. During 1993 to 1995 while doing pre-degree course I encounter unabridged versions of Mahabhārata. 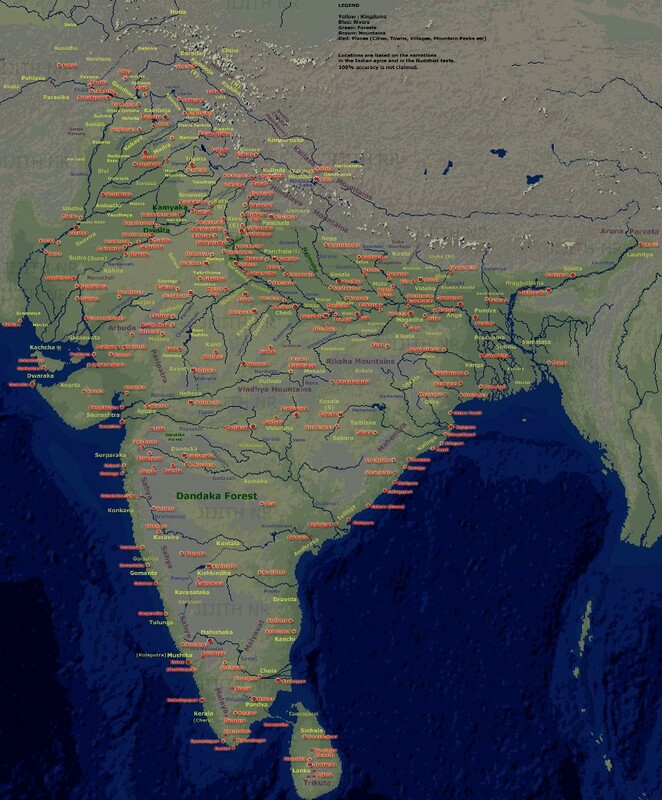 Using that I created a database of place-names mentioned in Mahābhārata which contained more than 100 entries. During 1995 to 1999 while doing my graduation in Engineering College I used computer software to create digital maps of Bhāratavarsha to plot the newly analyzed place-names. 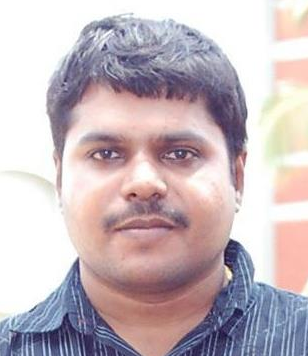 From 2001 to 2006 I worked in ISRO. There I studied the journals containing the ISRO satellite imagery of the dried-up Sarasvati river basin. It is here where I first encountered the journals describing Dr SR Rao’s discovery of the submerged town of Dwarka. I expanded my maps with these new knowledge about Dwāraka and Sarasvati. While working in ISRO I explored internet to get more information about our Itihāsās and it is when I realized that there is not much information available online on topics related to our culture while those about Greek epics were aplenty. I wanted to change this scenario. 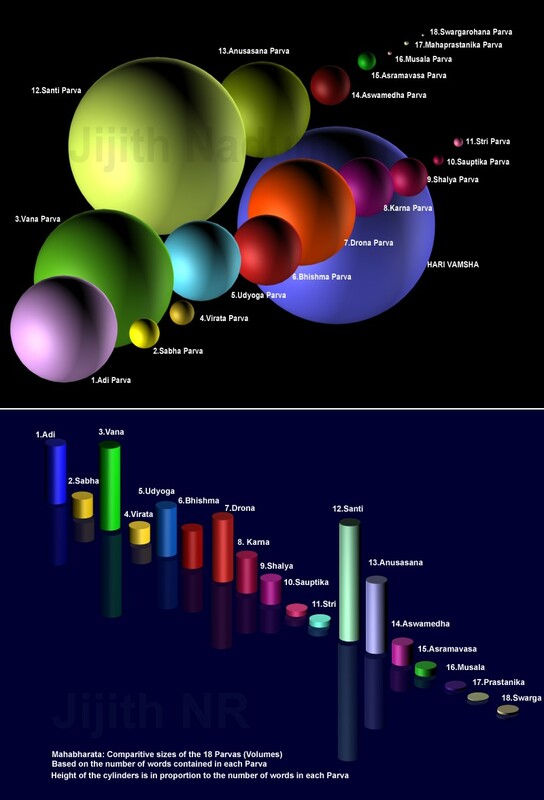 After many searches, in 2004 I encountered an online resource viz. Kisari Mohan Ganguli’s English Translation of Mahābhārata, in the form of downloadable text files at the website named Sacred Texts made available by the tireless work of John Bruno Hare. 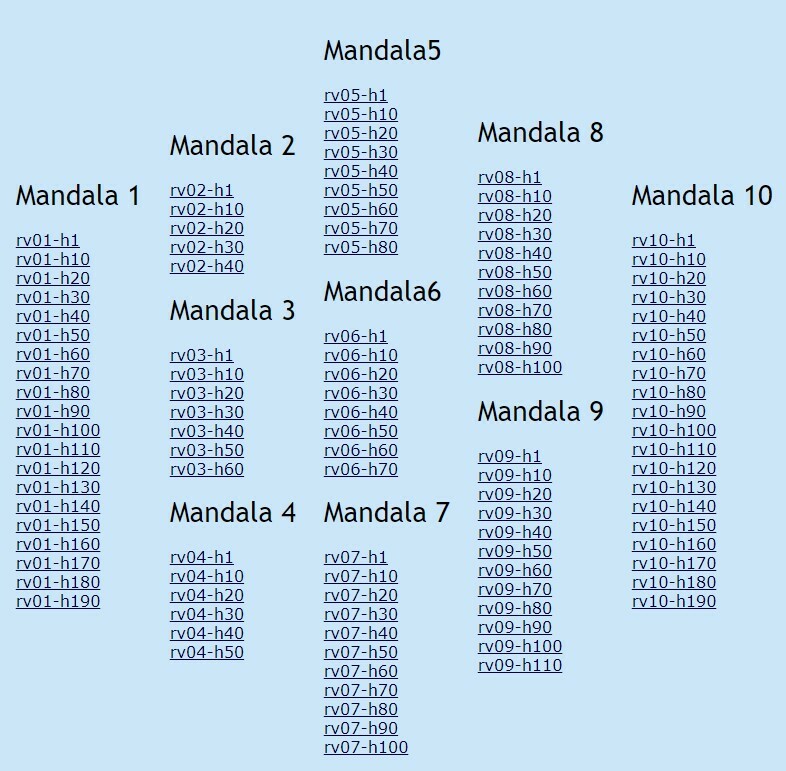 [i] Using the full text of Mahābhārata available for free in this site, I created a Windows-Help-File system for Mahābhārata, enabling me to zero-in on any desired noun in Mahābharata using the keyword search feature of help-file. 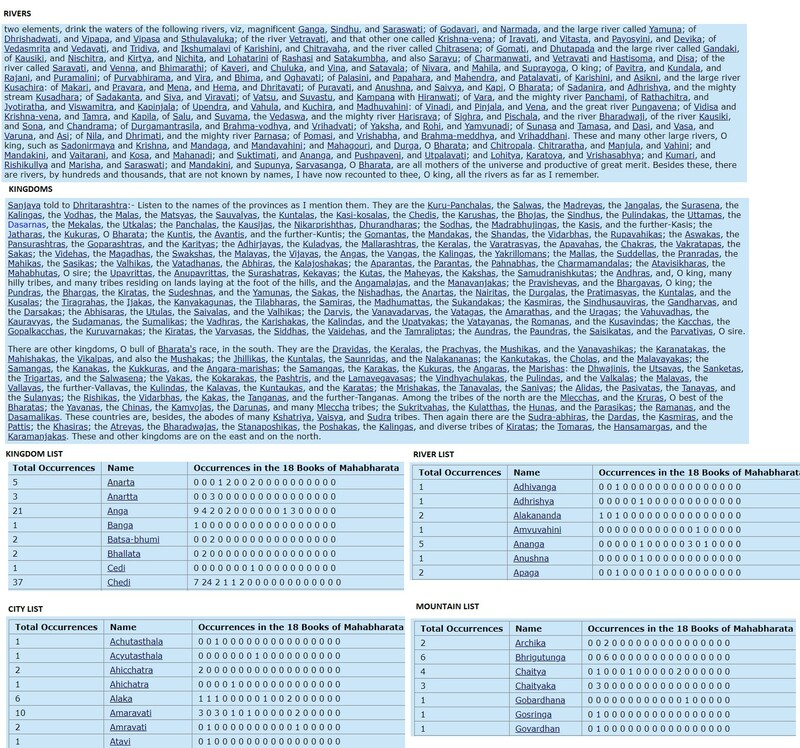 Using this help-file as a tool I created articles focusing on each kingdom mentioned in the Mahābhārata, such as Kuru, Pāncāla, Kosala, Chedi, Matsya, Trigarta, Surasena and so on. I wanted to host it at some location in the internet so that internet will get filled with enough information about our Itihāsās. That is when I found Wikipedia where anyone can become editor and contribute articles. I uploaded my articles on Mahābhārata kingdoms to Wikipedia in a format understood by Wikipedia[ii]. 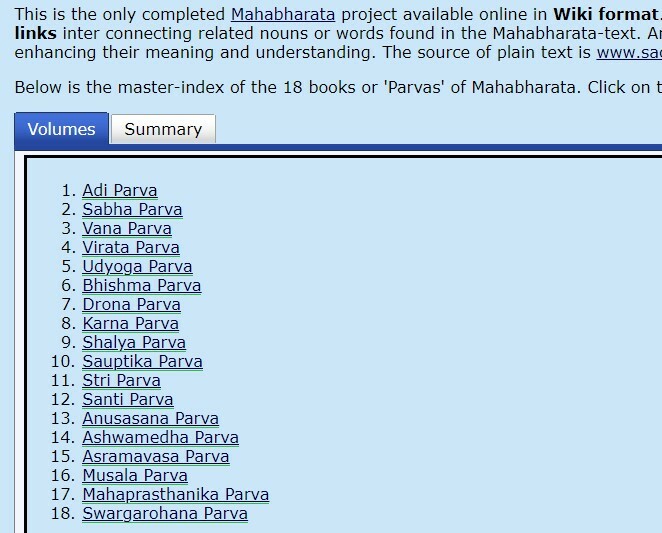 I authored 150 plus articles in Wikipedia describing each kingdom mentioned the Mahābhārata. This work continued in 2005 and 2006. But since Wikipedia is not a place to publish original research, and because of the rampant vandalism quite common in the Wikipedia pages as it can be edited and modified by anyone, it became necessary for me to create a website of my own but with the same features offered by Wikipedia, such as, the interlinking thousands of nouns through hyperlinks with each noun expanding into an article of its own, where each such article connects with thousand other articles through noun to noun hyperlinks forming a connected network of articles expandable in the form of knowledge trees. The website AncientVoice established in November 2009 was the result of this need. It was developed based on the approach outlined in the preceding sections. Initially I have created it to preserve my older works in Wikipedia. After creating a copy of all the articles, I wrote in Wikipedia, I concentrated my energy to create a Wiki for Mahābhārata. 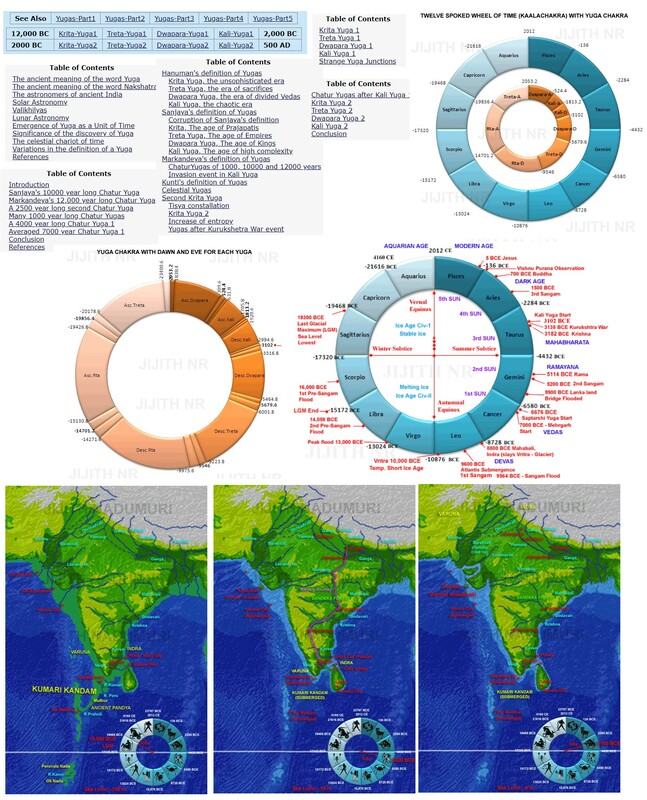 This involves creating a single-page article for each of the 2000 plus chapters of Mahābhārata, identifying the 7000 plus nouns in the Mahābhārata, connecting each occurrence of each of those 7000 plus nouns in any of the 2000 plus chapters of Mahābhārata through hyperlinks. I knew if I attempt to do it manually, it will take me many years. Hence, I automated the process by creating a software tool by coding in C++. I completed the development of software tool by January 2010. 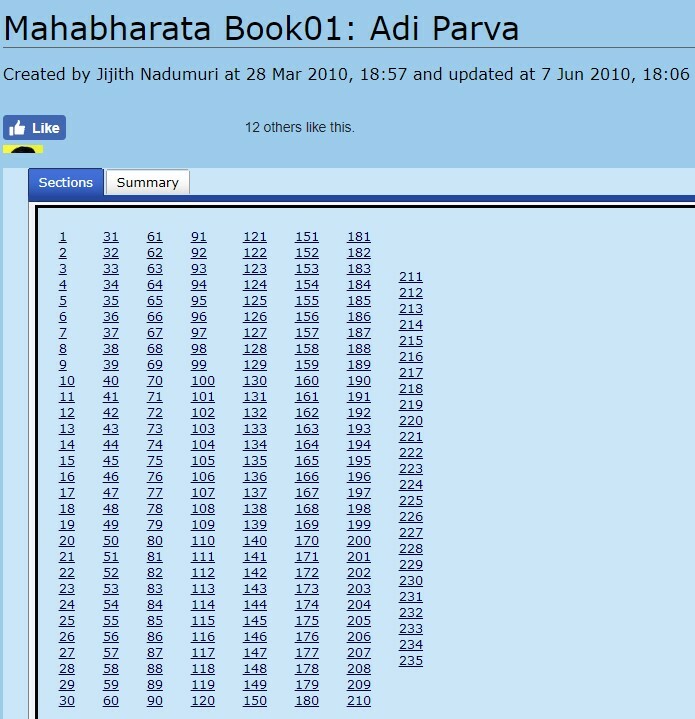 Using this tool, I generated the 2000 plus chapter-pages and 7000 plus noun-pages of Mahābhārata by parsing the full text of Ganguli’s translation. 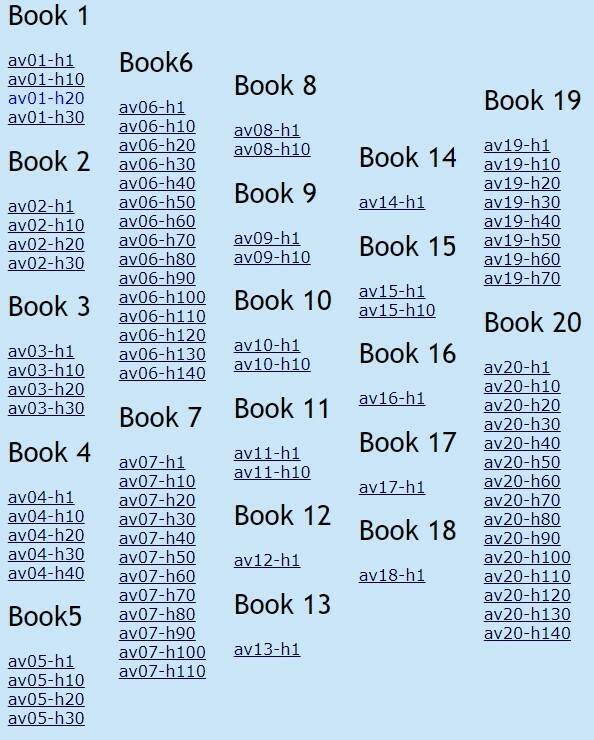 These 9000 plus pages were then interconnected with an average of 100 hyperlink in each page. Each hyperlink represents a noun-occurrence. Thus, the entire Mahābhārata Wiki contains more than one million hyperlinks. The software tool dumped all this page as text files in Wiki format in a matter of four hours. All these files were then systematically uploaded and the Wiki was completed in a matter of few weeks by around April 2010. 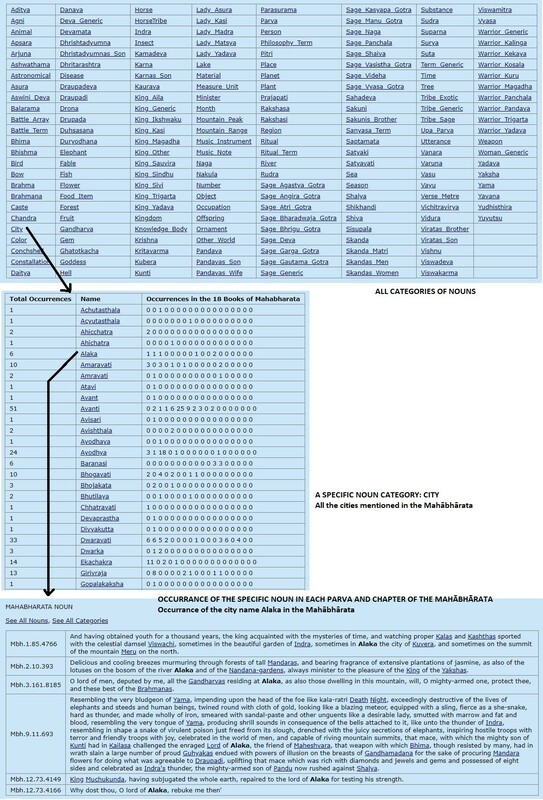 After the success of Mahābharata Wiki in 2010 similar Wikis for Rāmāyana, R̥gveda, Yajurveda (both Kṛṣna and Sukla recensions), Sāmaveda, Atharvaveda and Vishnu Purāna were completed in 2011. There is no other site anywhere in the world with dedicated Wikis for any of these texts. 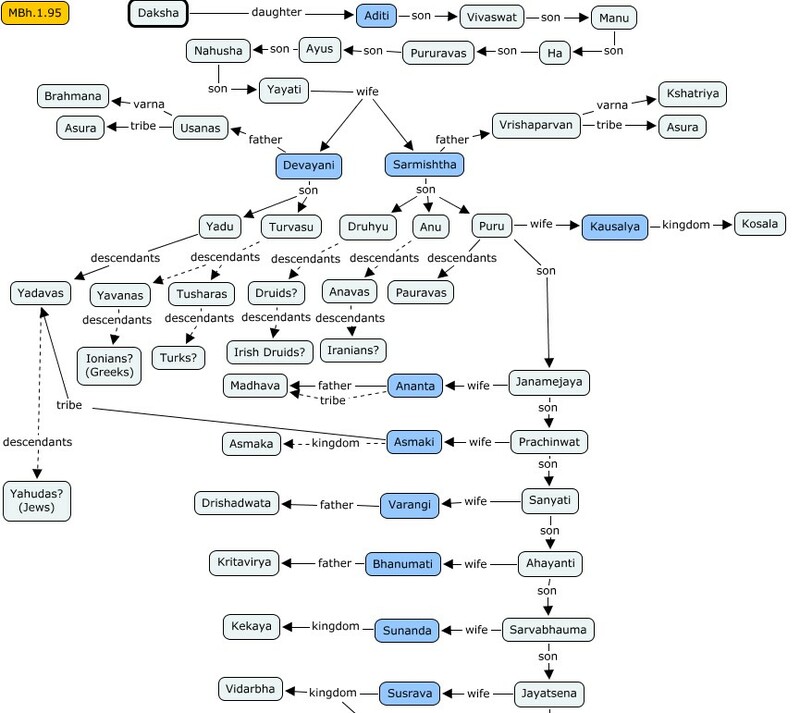 Apart from these Wikis, analysis articles discussing the Veda, Itihāsa, Purānās, heroes like the five Pāndāvas, lineage trees of Ikshvākus, Ailās, Pūrus, Bharatās and Kurus, maps of Bhāratavarsha with its kingdoms, cities, towns, villages, rivers, forests, mountains etc and many paintings depicting various scenes from the Mahābhārata, all of these are hosted in the site. The total number of pages in the site now exceeds 23000. Apart from AncientVoice, a similar website named Takshasila[v] was created for with Wikis for Iliad, Odyssey and Avestan texts like Vendidād, Visperad, Yasna, Yast and Siroza were created. Another site named Naalanda[vi] with Wikis for the major Upanishads, Tamil text Tirukkural and Silappatikaram was created subsequently. My analysis of the Quantum Consciousness studies and other recent topics is published in yet another site named RecentVoice. A fourth website named Technospace containing my technical articles related to software is not updated now. 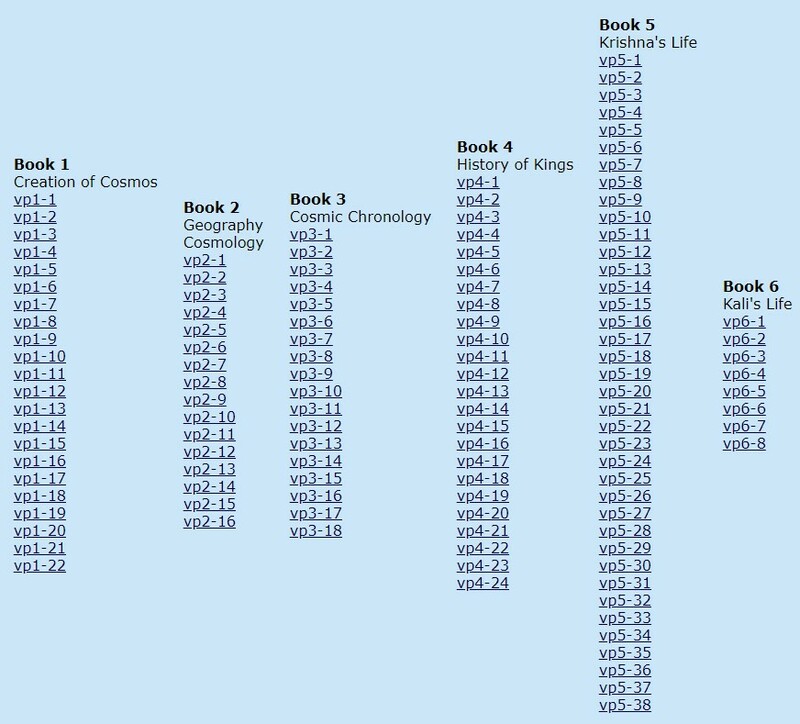 AncientVoice website is a well structured digital portal into the Veda Itihāsa Purānās with rich in data, analysis articles, diagrams, illustrations, comparison charts and digital maps of Bhāratavarsha. It is like a huge ocean of information. It is used as a reference site by researchers from different parts of the world. University research students, novelists writing novels based on Veda Ithiāsa Purānas and researchers in the academia are using the site for their research works. All the content in this site is published under Creative Commons Share Alike Attribution License. This allows any researchers to use data in this site without copyright related complications, by providing due credit to the website and its creator (myself). The site is made available for benefiting the entire research community and writers focusing on Bhāratiya Samskr̥t literature, culture and tradition.